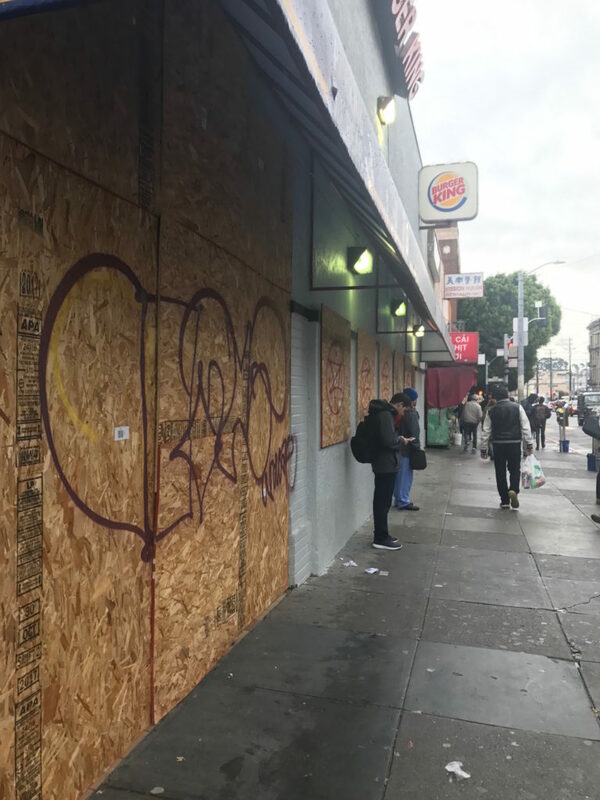 Looks like the Mission isn’t losing a go-to spot for costumes and cheap clothing after all. 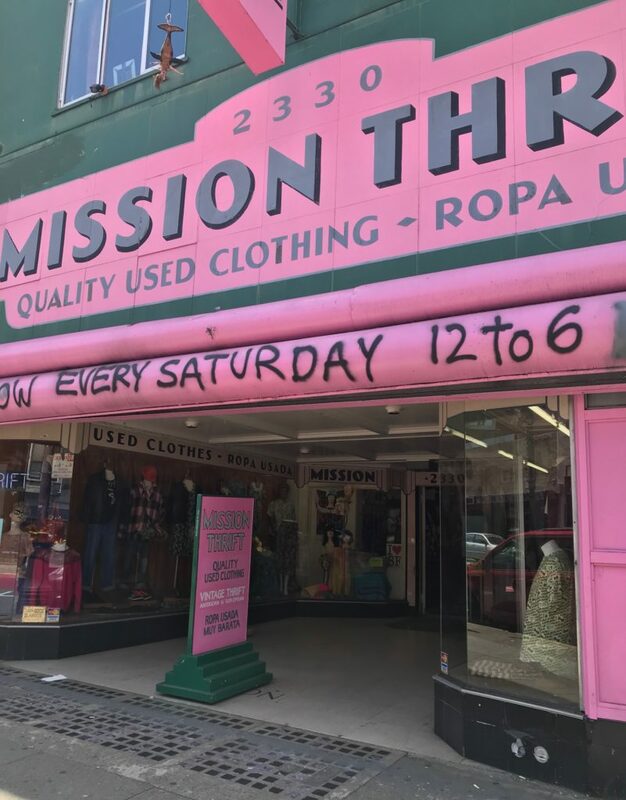 Mission Thrift’s owner told Mission Local late in December he was closing the shop after 20 years in business. While the original plan was to stay open Saturdays just until the remaining stock was sold off, the store was still bustling last weekend and store’s manager told me there had been a change of plans. 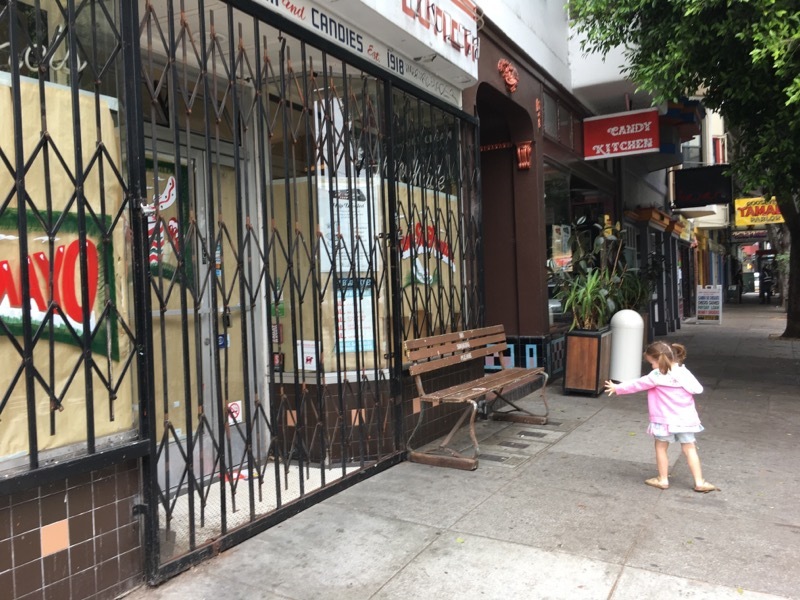 The store, at 2330 Mission Street, will stay open, from 12 to 6 p.m. on Saturdays, and there’s talk of adding Sundays, once they can hire the staff. As deals go, that’s a good one. St. Francis Fountain is again operational – sort of. 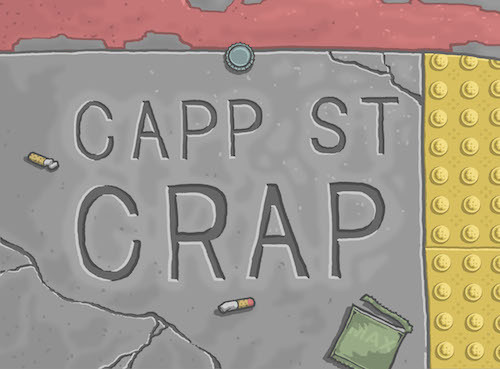 Capp Street Crap got word this morning that the beloved diner and ice cream parlor, which turns 100 this year, has returned after a three-month closure for repairs. A friend, who agreed to go by and check it out, reports that only the Candy Kitchen portion of the diner was open for business but employee told her they hope to have the front room open by the weekend. Hooray! 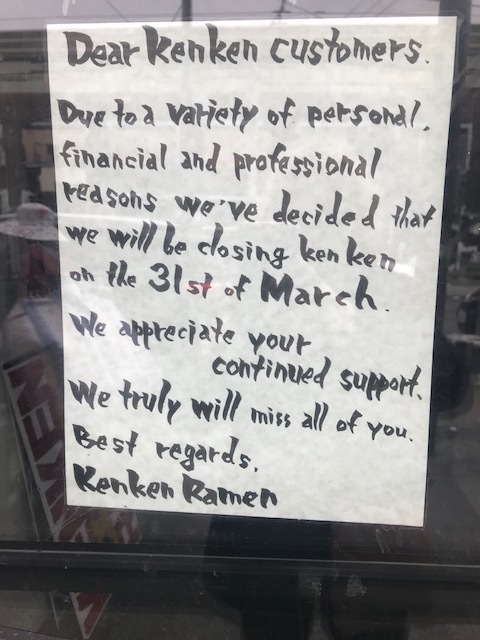 After five years, popular Mission ramen spot Ken Ken Ramen has called it quits. 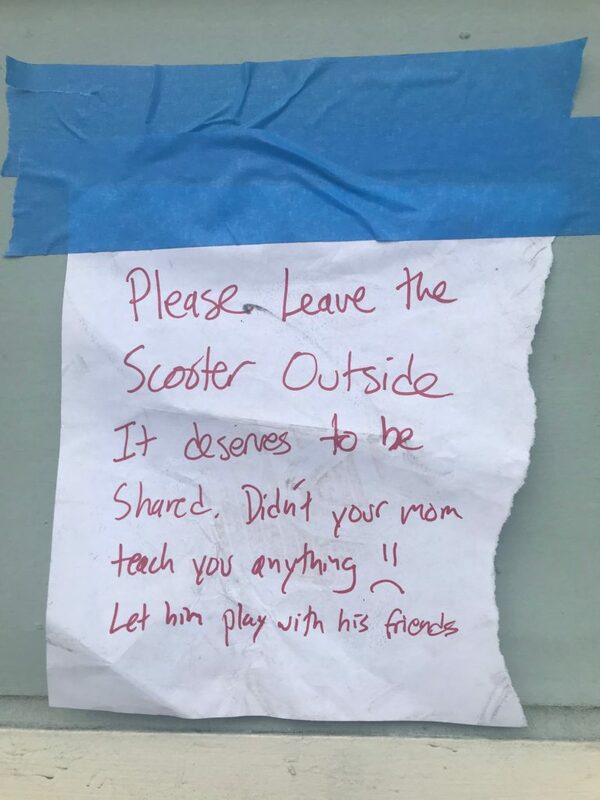 A note posted in the window of the 18th Street restaurant says the decision to close was for “personal, financial and professional reasons.” The restaurant’s last day open was apparently Saturday. While Ken Ken is no more, it looks like the space will remain a ramen restaurant. 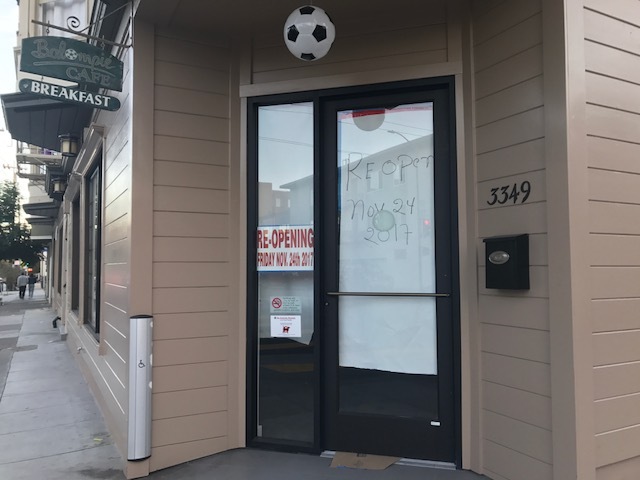 A transfer of ownership notice on the front door says the name of new restaurant is Ramenwell. UPDATE 2/20/18: A Doc’s Clock employee has also launched a GoFundMe campaign to raise money to move the bar’s neon sign. Amy Benjamin, who has been working at the bar for the past four years to pay for college, said starting the campaign was the least she could do given owner Carey Suckow’s countless efforts to raise money for community causes. Among other efforts, Benjamin noted fundraisers Suckow has held at the bar for animal rescue groups and the victims of Mission fires. 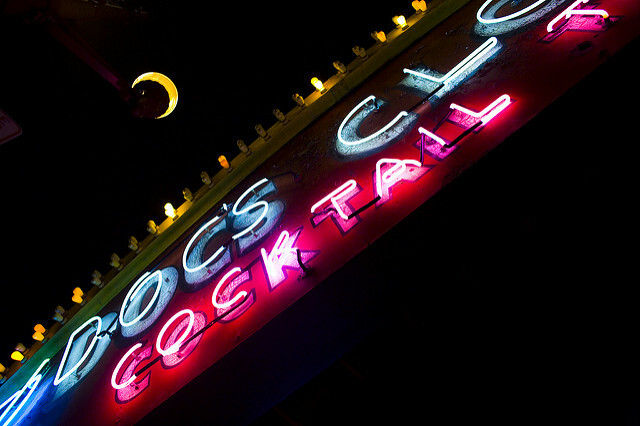 ORIGINAL POST: Doc’s Clock could see its name in lights once again. 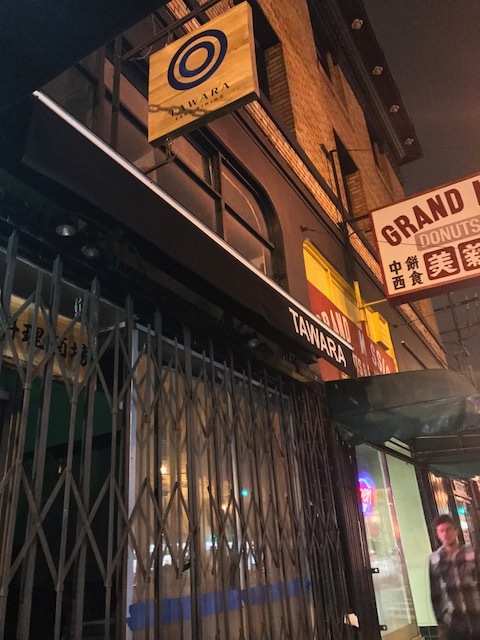 After losing its lease and moving down Mission Street without its iconic neon, the bar has come to an agreement with its former landlord to get the sign back. Carey Suckow, Doc’s owner, said she’s been working to secure permits to move the massive Doc’s Clock sign from its old spot at 2575 Mission St. to the bar’s new digs two blocks away at 2417 Mission. Doc’s former landlord had previously announced that she planned to open a restaurant in the bar’s old spot and wanted to keep the bar’s sign there. Moving the sign won’t be cheap. Suckow estimates the cost at upward of $20,000. “We had an issue with a neighbor at our new space so costs will go up, but we are determined to make this happen,” Suckow explained in an email. The bar has a fundraiser scheduled for March 2nd at the bar, complete with silent auction and raffle, to raise money to defray the cost of relocating the sign. Or, as Suckow points out, you can always come in a buy a drink or two on any other day to lend your support. As the sign states: It’s “cocktail time,” indeed. The (Burger) King is dead. 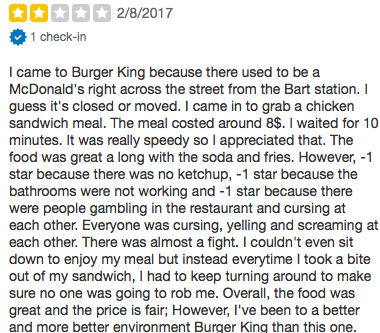 The fast-food franchise has abdicated its throne as the last standing cheapo burger joint at the intersection of 16th and Mission streets following the closure of McDonald’s, which formerly sat across the street, in 2015. 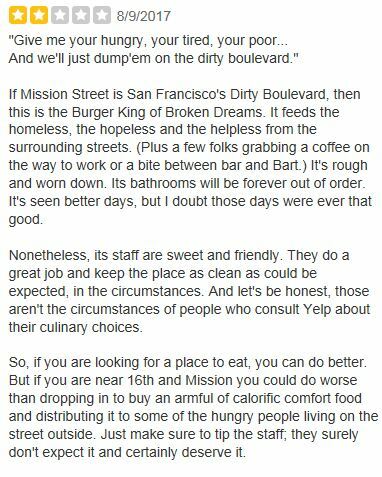 Joe Arellano, a spokesman for a proposed housing development the Burger King sits in the middle of, at 1979 Mission St., said the restaurant’s owners decided to shut down on their own. Missing Balompie Cafe’s amazing pupusas? The wait is almost over. 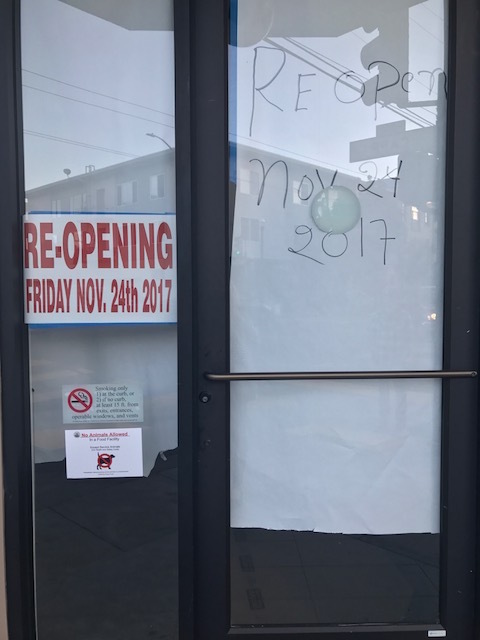 Signs have gone up in the restaurant’s entrance at 18th and Capp Street announcing a reopening date of November 24th. The spot has been closed since late May of 2016 while their building has underwent a seismic retrofit. Urban Fish took its last gasp months ago, and it appears a Japanese restaurant is set to breathe new life into the space. Signs have gone up outside 2193 Mission near 18th Street, indicating that the tiny restaurant space could be soon home to a restaurant called Tawara that offers “sake dining,” which I can only assume is Japanese food with a substantial sake menu. Based on a peek in the window last night, it seems as though the new owners still have a way to go on the restaurant’s interior. Urban Fish, which was Weird Fish under previous ownership and known for its vegan and pescatarian options, closed roughly four months ago. An attempt to reach Urban Fish’s owner in August was unsuccessful, but an employee at his neighboring restaurant, L’Emigrante, said the other restaurant had sold. 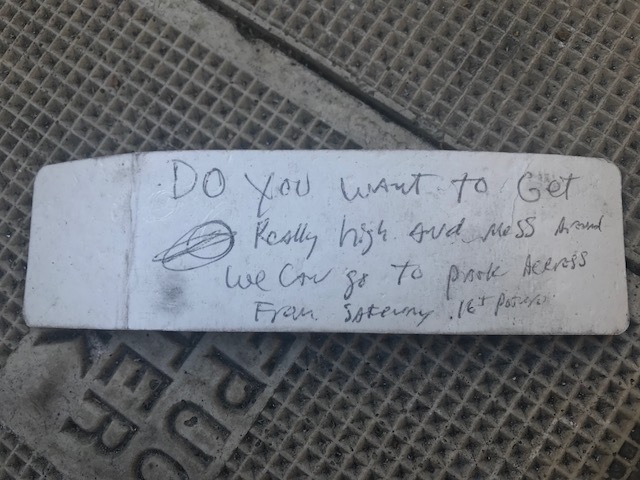 Finally, some good news for a Valencia Street tenant. Much-loved Vietnamese restaurant Mau appears to have reached a last-minute deal with its landlord on the day it was slated to close. 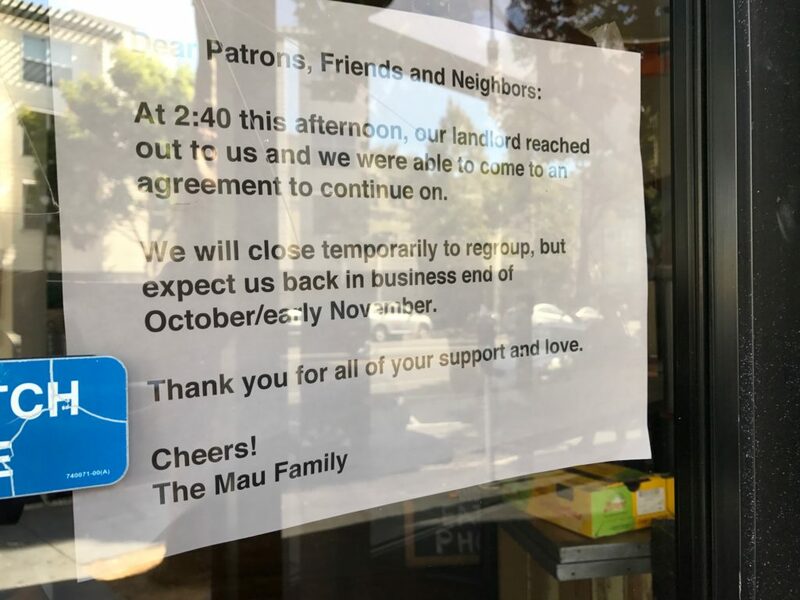 A sign in the restaurant’s window states that as of 2:40 p.m. Saturday their landlord reached out and both sides were able to come to an agreement that will keep Mau open at 665 Valencia St. The restaurant is currently closed and will remain so until late October or early November to “regroup,” the sign says. A man cleaning windows this morning at the restaurant said he didn’t know anything about the new agreement, only that Mau had been scheduled to close due to a rent increase. Thanks to Twitter user klau who alerted us to the good news.